Welcome to Wolfe Editions. I have limited edition museum quality color and black & white photographic works offered for sale. Works can be purchased framed or unframed. My framing techniques use proven archival materials and methods. All works are high quality archival prints. Black & White silver gelatin prints are hand printed to archival standards. Digital color prints are Epson 2000P Ink Jet Archival Pigment prints. All works are printed in limited editions with two artist's proofs. The number of prints in any edition may vary, please contact me for more information. Please contact me by completing the information here for pricing and details of available works. Images made with the Epson 2000P Ink Jet Printer are created using archival standards. They can be expected to last more than 200 years if properly framed and displayed. Color prints are matted with non-buffered Westminster 100% Cotton Rag Board (4 ply front and 2 ply back) with acid free foam core backing board. Black & white prints are matted with buffered Westminster 100% Rag Board (4 ply front and 2 ply back) with acid free foam core backing board. 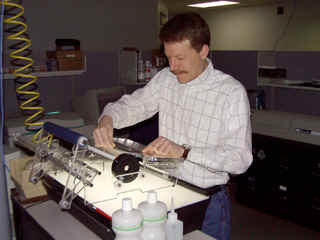 More information about archival ink jet printing can be found at the Wilhelm Imaging Research web site. 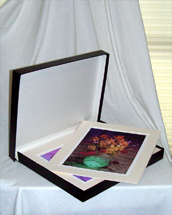 Information about archival matting and framing can be found at the web site for Light Impressions. Traditional photographic color negatives or color transparencies are drum scanned at high resolution for digital (computer) output. Images are quality controlled using Adobe Photoshop for printing. Digital color pigment prints are offered because traditional color prints may fade after only twenty years and are not suitable for most collectors. These techniques are currently in use in many museums in an effort to protect and preserve their collections of photographic materials. Silver gelatin prints use Oriental Seagull or Kodak Bromide photographic paper. Silver gelatin images are the most stable types of black & white photographs.